A mech is a robotic machine operated by a human pilot. The Walking Beast is Moltensteelman’s most famous mech, and we have learned a lot from creating and operating this mechanical giant. 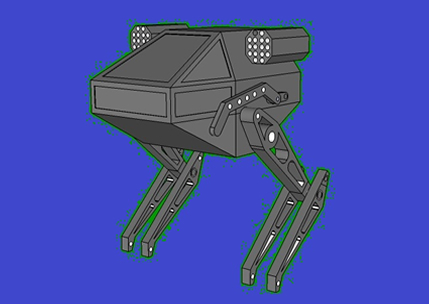 The next generation Moltensteelman mechs are the bipedal mech chariots and hexapod projects. A new linkage system will provide a smoother walking gate, power efficiency and ease of maintenance. We want these on the ground. And so do you. Or maybe you want yours to fly. It’s quite possible we can do that too, with your help. So please donate, these are going to be fabulous. A fire-shooting bipedal mech will pull a futuristic warrior chariot carrying a driver and passenger. We envision producing a small squad of these five foot mech robots that will be spirited enough that they might stampede if provoked. These next-generation Moltensteelman mechs will be lightweight and fold for storage and transport. This popular kinetic giant weighs 14,250 pounds and stands 11 feet tall. 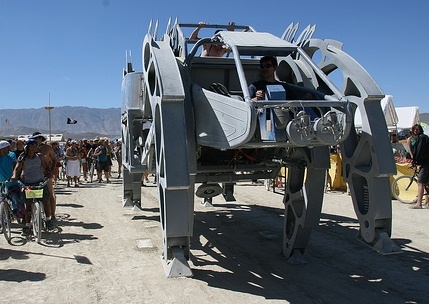 The Walking Beast has an international following, is the subject of many photos and videos, and it gives people the unique opportunity to ride on a real mech. The Walking Beast at the Burning Man Festival 2008. The initial prototype of the next generation Moltensteelman walking machine will be built at a comparatively small scale for experimentation. A mech about the size of a riding lawn mower will use a hip joint that allows each leg to sidestep (degrees of freedom) for steering. 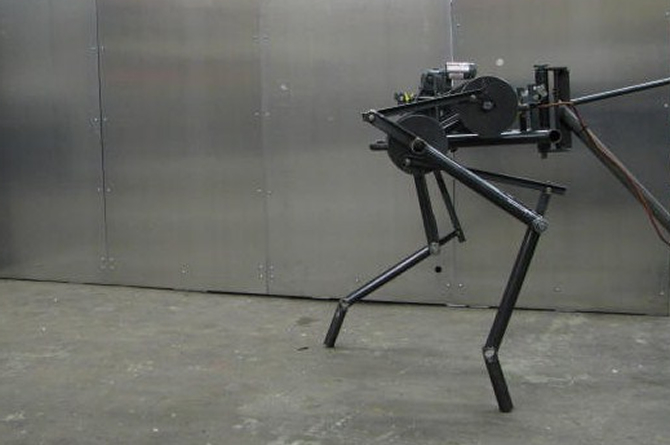 The next generation giant walking machine will be a computer-controlled hydraulic vehicle with six legs capable of walking on uneven terrain. Prototype leg for Moltensteelman Hexapod and Mech Chariots.